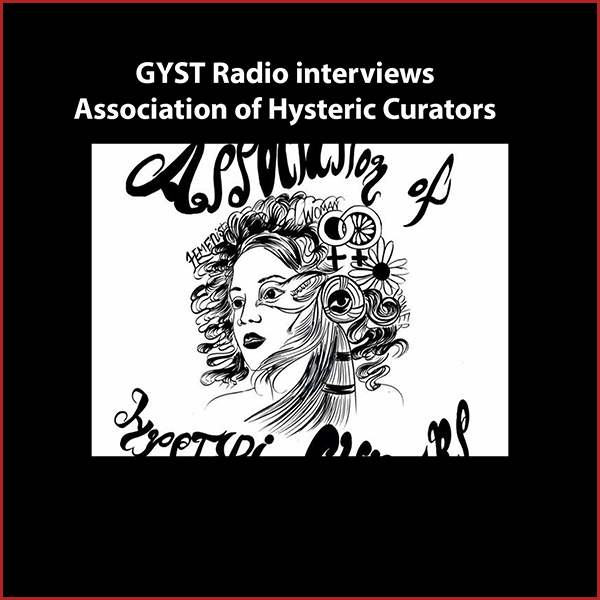 The Association of Hysteric Curators was founded in August of 2014 as a fluid, evolving, trans-generational group of women who gather bi-weekly to discuss contemporary feminism and the historicity of the term. AHC seeks to explore notions of female protest and the presence of gendered articulations through a non-hierarchical structure based in dialogue and exchange. Their curatorial agenda, also based in research, is to spread and break down barriers, expanding and amplifying the space for women in society. Guest on the show is are members Lili Bernard, Mary Anna Pomonis and Allison Stewart. Current AHC artists are: Virginia Arce, Malado Baldwin, Chelle Barbour, Lili Bernard, Carolyn Castaño, Angel Chen, Armando Cortes, Cherie Benner Davis, Rachel Finkelstein, Nat George, Christine Dianne Guiyangco, Hazel Handan, Emma Kemp, Isabelle Ludderodt, Meg Madison, Mary Anna Pomonis, Cindy Rehm, Kim Russo, Diana Sofia-Estrada, Allison Stewart, Guita Tahmassebi, Michiko Yao, and Alice Yoon.